Health Sciences and Services Authority (HSSA) of Spokane County was established in 2007 to provide funds to the life and health sciences research industry. These funds are used by researchers to help discover and advance new ways to combat diseases and promote public health in Spokane. Since being established, HSSA has focused on two strategic initiatives: increase local health sciences research and the infrastructure that supports it and increase access to care services in Spokane County for at risk populations. These initiatives have helped create a over 500 jobs and $100 million in total economic activity including over $35 million in extramural grant funding to Spokane. Research shows that the Life Sciences sector has the greatest economic growth potential for our region - with estimates of an annual impact of up to 9% increase in GDP and more than 9,000 high wage jobs by 2030. 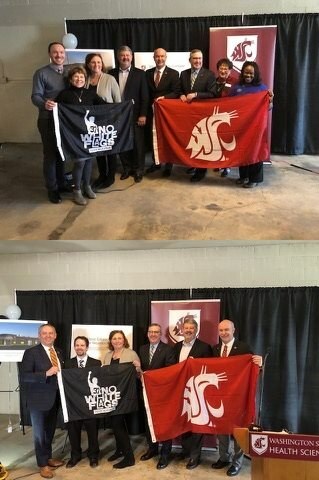 HSSA joined WSU Spokane, Team Gleason, St. Luke’s Rehabilitation Center and Avista on January 15 to announce the new Steve Gleason Institute for Neuroscience, located close to the new pedestrian and bicycle bridge at 325 East Sprague Avenue in the University District. Steve Gleason is a local and national hero, former football player at WSU and for the New Orleans Saints in the NFL. A husband and father, Gleason was diagnosed with amyotrophic lateral sclerosis (ALS, sometimes called Lou Gehrig’s disease) in 2011. He continues his valiant efforts on behalf of others suffering from neurological diseases including his successful efforts to achieve Medicare modifications in the Steven Gleason Act, an Act of Congress, and was recently was awarded the Congressional Medal of Honor for his many efforts. Other important partners in this venture are the City of Spokane, MultiCare Health, Providence Health. This is an important investment in medical research for those who suffer from neurological diseases such as ALS, Parkinson’s and Alzheimer’s. HSSA was both "pleased and proud to support the Steven Gleason Institute for Neuroscience here in the University District for the important work it will do, and in recognition of one of Spokane's own sons," HSSA Board Chair Nancy Isserlis said at the launch of the institute. “This $250,000 of support was by a unanimous decision of our Board. "Isserlis went on to say that "More important, is the exciting opportunities for better treatment and care, and hopefully one day, even cures, for these debilitating diseases." Our third Spokane Life Science networking event is scheduled for May 2, 5-7PM at McKinstry, 850 E Spokane Falls Boulevard, across the street from Gonzaga's baseball stadium. Sponsored by Life Science Washington (LSW), Greater Spokane Incorporated (GSI) and the Health Sciences & Services Authority (HSSA) of Spokane County, this event provides an opportunity for like-minded people to get together and meet one another, discuss your research project or perhaps an educational or health care issue. We're simply assisting you while creating broader bandwidth in the life/health/bio sciences here in Spokane. Come join us and enjoy a beer or wine and food. Besides, it's free! The canceled March Board meeting has been rescheduled in a "special" board meeting to be held May 6, 2019 at 3 PM in the Ignite Northwest Technology Center, 120 N Pines. HSSA board meetings are open to the public. This is a heads up to save the dates of May 29-30, 2019 for this second annual East West Summit brought to you by Life Science Washington, Greater Spokane Incorporated and HSSA. There will be a reception the evening of May 29th and the summit itself on May 30th, both at the historic Davenport Hotel. Join your west and east side life science friends for excellent content and to meet old and new friends. More to come as details become known. Center, Goa Room, on Wednesdays at 3 PM. HSSA Board meetings are open to the public. There are amazing innovations being made in the world of bioscience, biotechnology research, medical devices and much more. Learn about these innovations and stay updated about the latest bioscience advances. Each year HSSA sets aside about 15% funding from its revenues to fund proposals that create access to health care for certain Spokane County populations. Learn more about the grant and how you can apply. HSSA provides grants in five different categories each with a different purpose to the biomedical and Spokane communities. Learn more about each grant and how you can apply. Our funding can help you take your research to the next level with research grants open year-round allowing you to apply at anytime. Learn more and apply today!